President Donald Trump speaks during a rally at Florida International University on February 18, 2019 in Miami, Florida. 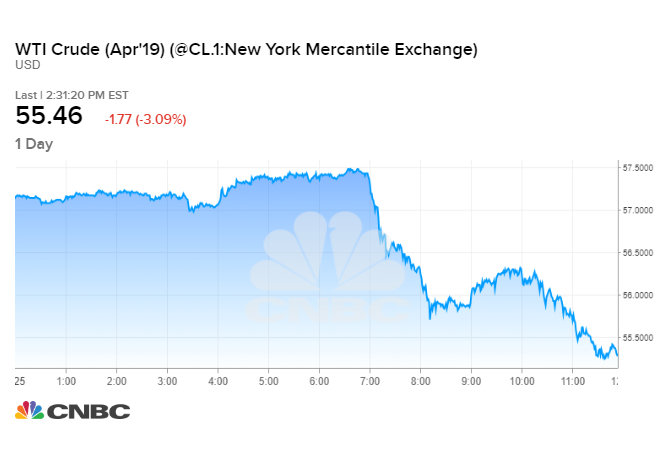 Oil prices tumbled more than 3 percent on Monday after President Donald Trump publicly urged OPEC to lower the cost of crude, putting pressure on the Saudi-led group to soften its price-boosting output cuts. “Oil prices getting too high. OPEC, please relax and take it easy. World cannot take a price hike - fragile!” the president said in an early morning tweet. The message comes two months into a fresh round of production cuts from OPEC and other nations. The producers meet in mid-April to review the deal, which is scheduled to last through the first six months of 2019. U.S. West Texas Intermediate crude futures ended Monday’s session down $1.78, or 3.1 percent, at $55.48 a barrel. On Friday, WTI hit a more than three-month intraday high at $57.81 a barrel. International benchmark Brent crude futures fell $2.36, or 3.5 percent, at $64.76 a barrel. Brent hit $67.73 a barrel on Friday, its highest intraday level since mid-November. Monday’s tweet marks the return of Trump’s criticism of OPEC, a staple of his second year in office and his early political messaging before running for president. Trump has not tweeted about OPEC since early December, right before the producer group and 10 allied nations led by Russia defied his calls to keep pumping at high volumes. The group instead agreed to cut 1.2 million barrels per day from the market. The so-called OPEC+ alliance reached the deal after oil prices sank more than 40 percent in the final quarter of 2018. The group first began curbing output in 2017 to end a punishing downturn, but lifted the caps last June as oil prices hit 3½-year highs ahead of Trump’s sanctions on Iran, OPEC’s third biggest producer at the time. Under pressure from Trump, the producers — and Saudi Arabia in particular — hiked output through November. That month, Washington surprised them by allowing some of Iran’s biggest customers to continue importing its oil as U.S. sanctions snapped back into place. The move contributed to the pullback in prices. Saudi Arabia has now sharply reversed course. After its output surged to a record 11.1 million barrels per day in November, it has throttled back production to 10.2 million bpd. Saudi Energy Minister Khalid al-Falih says the Saudis will cut even further, pumping at 9.8 million bpd next month. “When you read into the implication of [Trump’s tweet], it’s twofold. First you have to believe the Saudis are going to take note. They have in the past,” said John Kilduff, founding partner at energy hedge fund Again Capital. The Trump administration further disrupted global crude flows last month by blocking oil shipments to and from Venezuela, which mostly impacts shipments of heavy crude used by U.S. refiners. The Iran sanctions and OPEC cuts have already tightened supplies of medium and heavy sour crude. A stand-off over Venezuela’s leadership has gripped the OPEC member for the last month, with the U.S. and dozens of other nations backing opposition leader Juan Guaido, while Nicolas Maduro clings to his disputed presidency. The conflict led to deadly border clashes this weekend. “While the decline in net exports has been softened so far by the use of domestic light crude for blending, we believe Venezuelan disruptions are likely to accelerate in coming months to potentially 200-300 kb/d if no political resolution occurs,” Goldman Sachs said in a research note on Monday. In all his tweets at OPEC last year, Trump did not express a specific price preference, but in the past he has said oil should not sell for more than $40 a barrel and should ideally trade at $25. Those price levels would bankrupt many U.S. oil producers and make it difficult for even the healthiest drillers to turn a profit in the shale fields driving the boom in American output. Rising U.S. oil production, stockpiles and exports have kept a lid on crude prices. Concerns about a global economic slowdown and lower oil demand amid the U.S.-China trade dispute have also weighed on the market. Saudi Arabia can produce oil at a lower cost than U.S. drillers, but the kingdom needs higher oil prices to balance its budget and pay for generous social programs that underpin stability in the nation.